Prior to the 8th printing of Know the Future, I went through the entire book page by page with a critical eye. I wanted to find and rewrite unclear parts, remove unneeded or redundant parts and incorporate new insights acquired since the last printing. Sometimes this meant removing and adding entire chapters. I also wanted to focus on providing more charts to illustrate complex points better. This took me a few months. When I was done, I asked readers on my forum to read the new draft and give me feedback (just as I had done with the 7th edition). The response was overwhelming. I received so much helpful feedback that I was busy for a few more months fixing typos and implementing the suggestions. The entire process was long and painstaking to go through, but I'm very glad I took the time because it came out better than I imagined. The 8th edition feels very complete and is easier to understand. I'm very pleased with it and I'm sure readers of past editions will be as well. 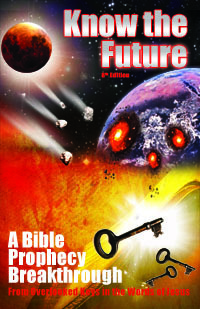 In fact, if you have been thinking of rereading Know the Future, there's no better way and time now that the 8th edition is out. This is the new full page chart found inside the front cover of the book. It depicts the Revelation Roadmap. multiple updated copies at a discount here .